Last month there was a big buzz in the local anti-choice rumor mill about a “born alive abortion” that had allegedly occurred at a Phoenix clinic. I reported on the absurdity of the whole allegation at that time and how the MSM ought not allow themselves to be played by wild-eyed anti-abortion zealots. But, apparently, Channel 12 in Phoenix sees a real public interest in helping those zealots to harass abortion providers and in giving out potentially identifying information about a patient (her age), as they did on the Thursday 10pm broadcast. 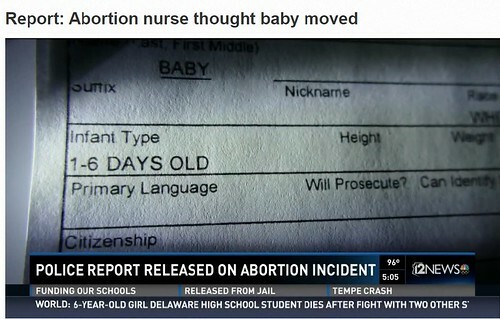 The police reports shows the mother, 27, had been scheduled for an abortion, but went into what the report called, “spontaneous labor.” The doctor at the clinic near downtown Phoenix told police she had checked for a fetal heartbeat before the procedure and found none. She said she believed the baby would be stillborn. The reports said a nurse went to weigh the fetus, which is standard procedure, and thought she saw it move and struggle to breathe. “Oh my God this fetus is moving,” the reports claim she said. Staff at the clinic then called 911 and paramedics began CPR while transporting the baby to Banner University Medical Center, the report said. But doctors there did not find a heartbeat and pronounced the baby deceased within a few minutes. Under federal law, abortion clinics have to provide medical care to a baby that survives an abortion. So it appears that this was not even an abortion but a stillbirth that happened to take place at a clinic, where the staff there did everything they were supposed to do in that situation. 12 News could have left it at that and redeemed themselves with a mea culpa for having been suckered by anti-choice conspiracy loons. Sadly, no, they could not do that. Instead, they ended the segment by interviewing some gross anti-choice dude from his book-lined office and let him insinuate that something criminal had indeed taken place at that particular clinic and also that any pregnancy outcome that is not a full-term healthy infant is cause for suspicion. Pro-life activist and lawyer John Jakubczyk said the uproar wasn’t over whether the abortion was legal, though he has questions about that. He said it was a moral protest. It is truly chilling to realize how successfully anti-choicers are enlisting local news stations in their crusade to criminalize women’s health care. Jakubczyk is more than just some gross anti-choice dude. He’s a particularly sleazy deacon of the The Ministry of the Morally Bankrupt and Pathologically Self-Righteous Knowers of What Jesus Really Wants. In the ’90s he helped organize anti-medical blockades and harassment at abortion clinics. Then he defended in court anyone arrested for doing Gawds Werk. He was also a follower of a movement of medical denial lawyers who’s contribution to spreading Jaysus Word was to file bogus medical malpractice lawsuits against abortion providers. Lots of them. After that admission, Judge Kamin threw out the lawsuit–and shortly thereafter, took even harsher action. On the request of Finkel’s attorney, the judge assessed thousands of dollars of sanctions against Jakubczyk (according to court documents, enough to pay Finkel “back for every single penny” the suit had cost him). Yeah, Ch.12 is definitely Fox lite. Marc (my ‘stache makes me distinguished) Curtis never misses a chance at interjecting either the both sides do it BS, or undercutting a guest making a conservative guest look foolish. The choice of Jakubcyzk and to run his statements no matter what, is obviously slanted….not journalism. On November 7, NBC’s Phoenix affiliate Channel 12 News aired an interview with Herrod, the president of the right-wing Center for Arizona Policy (CAP). A promo for the segment described Herrod’s critics as being “hypocritical,” depicting her as a “Christian catching hell” because of her religious beliefs.